The hostel was established to house people displaced by war who emigrated to Australia under a program run by the International Refugee Organisation. 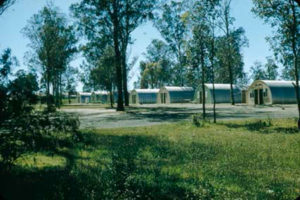 Accommodation at the Villawood Migrant Hostel was initially provided in former army huts. 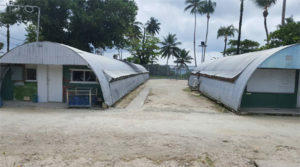 Some of these huts were from a former military camp at Manus Island, Papua New Guinea (PNG). Over 50 years later, this same military architecture has been redeployed to warehouse both asylum seekers who sought protection within Australia and those who were exiled to the Australian-run prison on Manus Island. There emerges a continuity in which asylum seekers fleeing war, conflict and violence are housed in these military structures and installations that are part of the apparatus of the prison and border complex. In the 1970s, for example, Vietnamese refugees were housed in the very rudimentary Fannie Bay Gaol in Darwin in what was ordinarily used as the ‘Children’s Section’.